Unlike the Emmys or the Academy Awards, the Grammys actually give out a bunch of awards before anyone is even on the red carpet, getting things like Best Music Video and Best Spoken World Album out of the way—despite the fact that the latter category seemed to be setting up a thrilling feud this year—before the ceremony starts. Of course, the pre-show Grammys aren’t exactly the equivalent of the important-yet-boring technical Oscars: Whole genres were cleaned out—including rock, classical, dance, and R&B—a half hour before the telecast. Once the show started, though, another message from the opening performance became clear: This was (mostly) Kendrick Lamar’s night. He won Best Rap Performance, Best Rap Song, Best Music Video, and Best Rap Album. He won almost every award he was up for, suggesting that Lamar should think about releasing a comedy album or some kind of classical/jazz/folk experiment just to see if he can take over the whole ceremony. Other big winners include Alessia Cara for Best New Artist, Dave Chappelle won Best Comedy Album, and—much to the disappointment of everybody, it seems like—Ed Sheeran won for Best Pop Solo Performance. 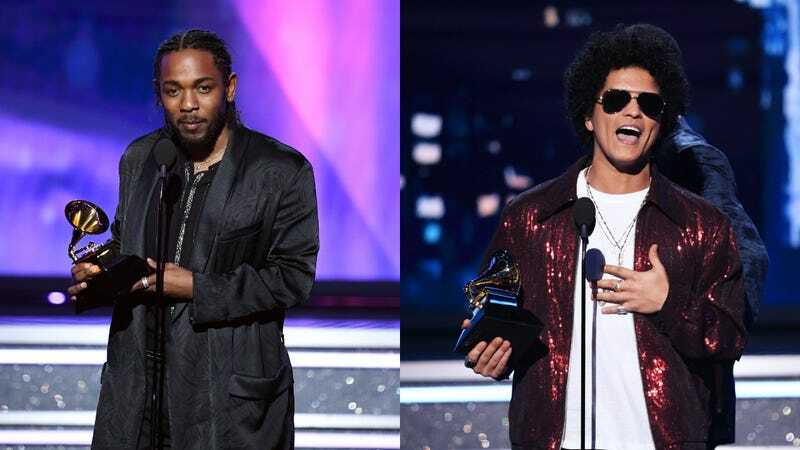 Then, at the end of the night, Bruno Mars pulled off a pair of upsets by beating Kendrick Lamar for both Album Of The Year and Record Of The Year with 24K Magic. Speaking of upsets, both JAY-Z and SZA were completely shut out. She was the most-nominated woman out of the whole batch, and he was the most-nominated artist overall. A partial list of winners in major categories is below, and we’ll update this post as more winners are announced.